Watching toddlers giggle, run, sing, and play together is almost guaranteed to bring smiles to even the crabbiest of adult faces. That play, according to most early childhood specialists, is truly their learning, and the “work” that helps young children’s brains grown and learn. But preschool and childcare comes with costs, according to NPQ and Martin Levine. Those costs are putting it out of reach for many who cannot afford the high costs of quality preschool and states that cannot subsidize the costs to meet their own standards of care for young children. What’s a parent—or a state—that wants its preschoolers to be “prepared” for kindergarten to do? Enter “the virtual preschool”—ta-da! It’s accessible. It’s inexpensive. It can be distributed in rural areas. Parents can manage it on their own. States can cut costs and reach thousands of preschoolers. What’s not to love? Online preschool programs have been growing in recent years, and thousands of parents have signed their children up. The programs offer everything from educational games to a full preschool curriculum complete with boxes of activities that are shipped to a student’s home and a teacher’s guide for an adult. Most online programs are offered by for-profit companies, although perhaps the fastest-growing is UPSTART, which was developed by the nonprofit Waterford Institute and is advertised as a kindergarten-readiness program. That program has been used by children in Idaho, Indiana, South Carolina, rural Ohio and Philadelphia, and is used by 30 percent of Utah’s four-year-olds. In 2013, the Waterford Institute received an $11.5 million federal grant to expand the program to rural children in Utah. Another recent study found that the brain chemistry of kids who fell into the category of smartphone or Internet addiction was different from that of non-addicted kids. In particular, changes were seen in the reward circuits of the brain, in the ratio of the neurotransmitter GABA to other neurotransmitters. (Interestingly, these changes generally reversed when the teens went through cognitive behavior therapy [CBT] for their addiction.) And other research has reported that cells in one of the reward areas of the brain, the nucleus accumbens, are activated when participants view Instagram pictures with more “likes,” which again suggests that social media use can tap into addiction pathways. In addition, there is a health overlay associated with too much screen time. Doctors have found that children using these devices are getting less sleep than those who do not use them, or who use them less frequently. And sleep is essential for brain development in young children, according to Keith Fabisiak, assistant chief of Pediatrics at Kaiser Permanente’s Santa Clara Medical Center. 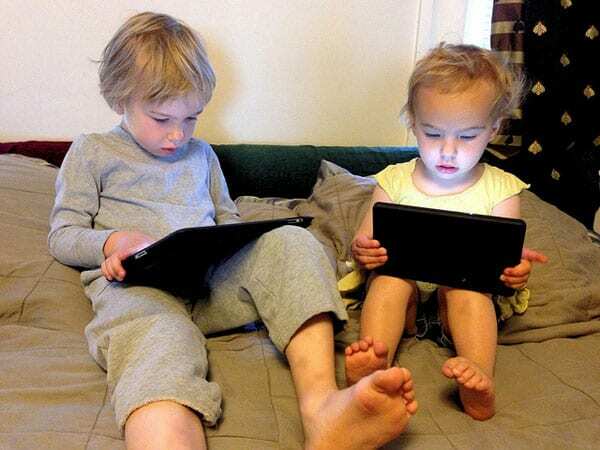 What’s more, children who are absorbed in their screens are usually fairly sedentary. The link between childhood obesity and excess screen time seems obvious. With close to 20 percent of American youth between ages 2 and 19 classified as obese in 2015–16, alarms should be sounding.